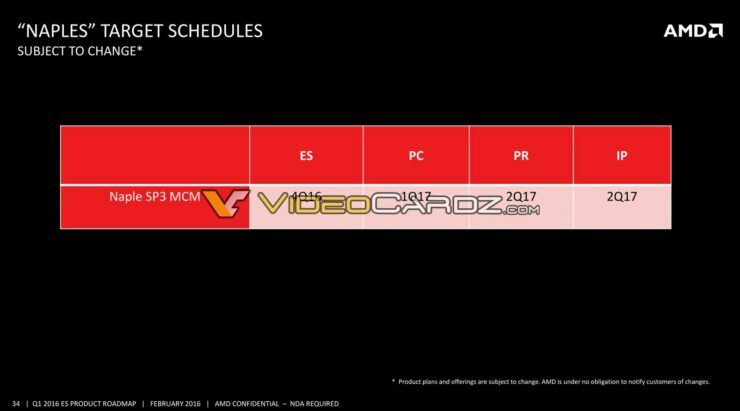 A massive AMD internal roadmap detailing their upcoming enterprise CPU products has just leaked out by Videocardz. 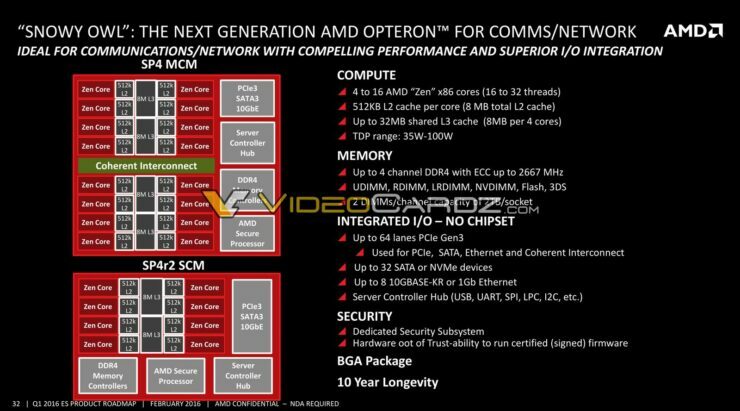 The roadmap reveals all of AMD’s CPUs that will be based on current and future revisions of the Zen core architecture. 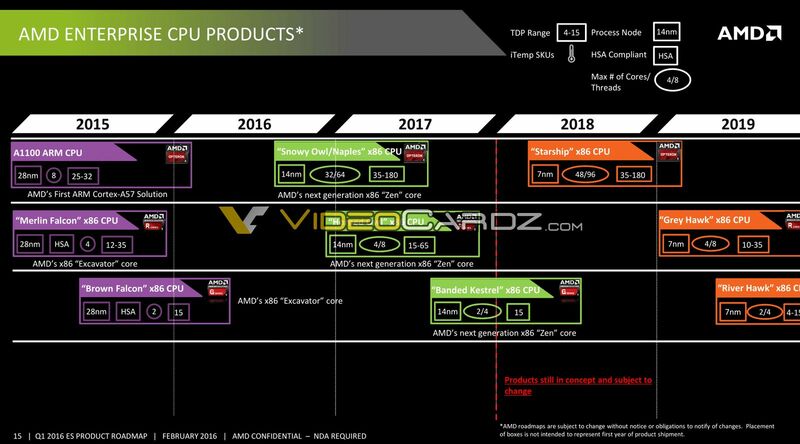 There are a total of 9 CPU products that the roadmap mentions. It’s dated back to Q1 2016 so a lot of changes may have been made but the details are quite juicy. 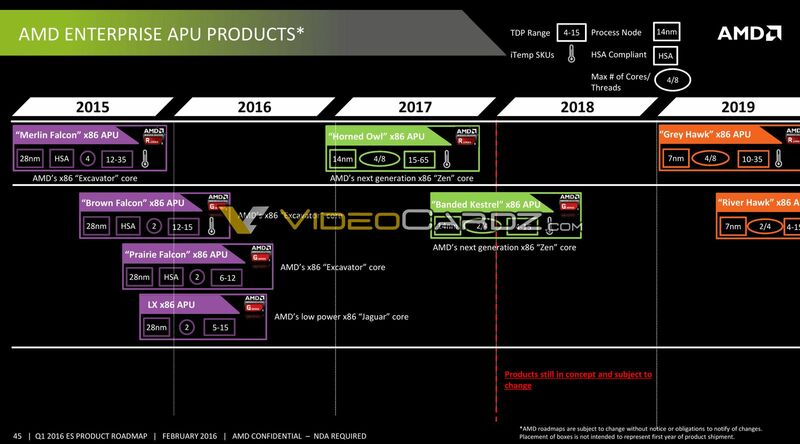 From 2015 to 2016, AMD has launched 3 CPU products codenamed A1100 ARM which utilized ARM Cortex-A57 cores, Merlin Falcon which used Excavator cores and then another Excavator based product, the Brown Falcon CPU. Moving on, AMD plans to launch a range of 14nm products in 2017 and 2018 based on their next-generation Zen core architecture. First up, we have the most interesting product of all the mentioned inside the roadmap. This product is codenamed Starship and will utilize the latest 7nm Zen core architecture which launches next year. 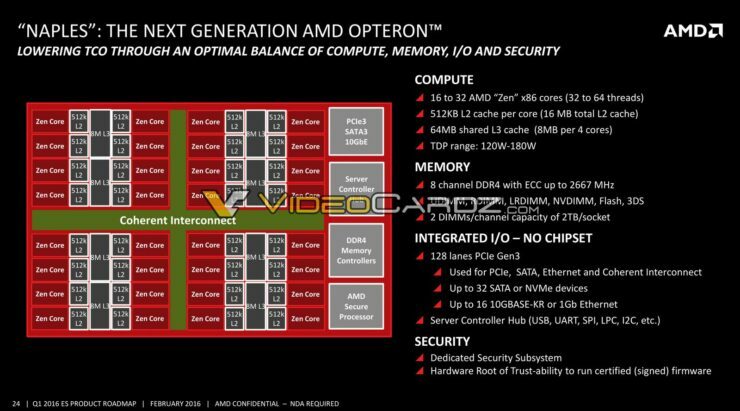 The Starship server CPU was leaked a while ago but now we can tell that this is where AMD is headed in the roadmap. 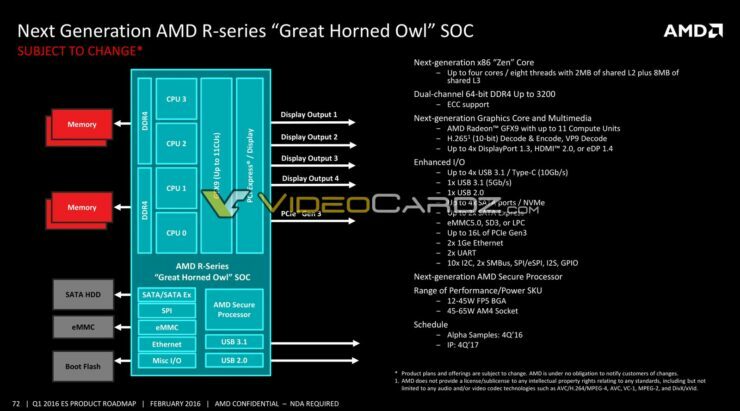 The new chip is designed to leverage from the Zen 2 cores which will be available in early ’18 and would also power AMD’s Pinnacle Ridge family of high-end desktop processors. The details mention that the Starship x86 Enterprise CPU would replace Naples in 2018 and would come with the brand new 7nm Finfet process that delivers increased efficiency and more denser designs. 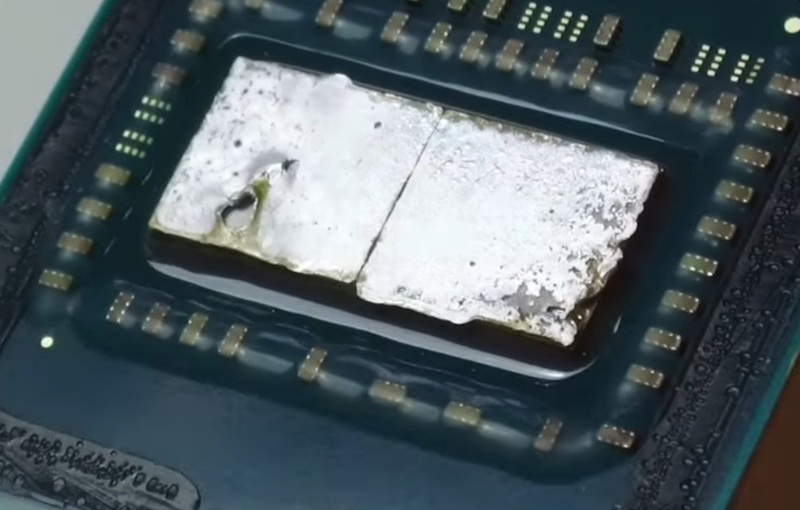 This would allow AMD to cram a total of 48 cores on this chip which is just monstrous. Along with 48 cores, we would get 96 threads. Of course, the chip would be available in various configurations and TDPs will run between 35W up to 180W. 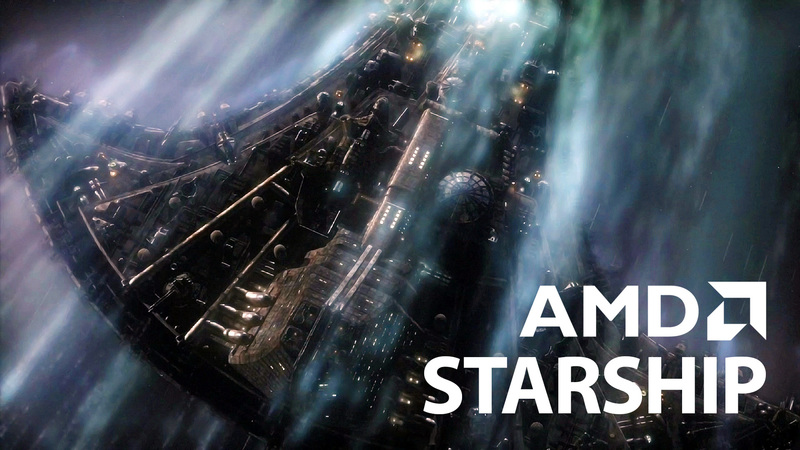 The new starship CPUs will be branded as the new Opteron processors that will further increase the competitive nature of AMD in the enterprise and datacenter landscape. Coming to Naples, we covered the chips in full details over here. 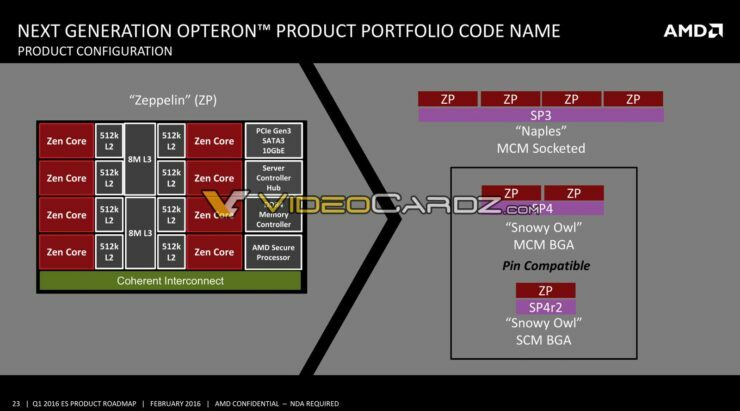 There are still a few interesting bits of the chips that include the 14nm Zen based architecture. The chips would feature up to 32 cores and 64 threads while shipping with TDPs of 35W and 180W. 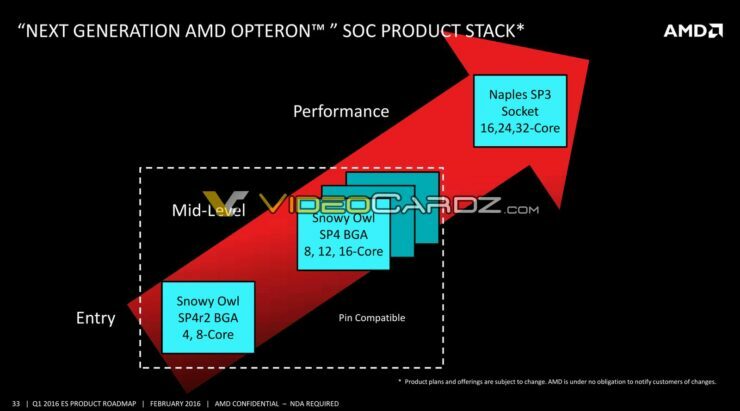 So the same as Starship, however, the latter offers increased performance per watt and more cores. One interesting details confirmed in the block diagram is that the Naples CPU is based on four Zeppelin dies which equivalent to 32 cores (8 cores per ZPs). The core count for each Zeppelin die is higher than the Core Complex (CCX) featured on Ryzen processors. You can see to it as this way that each Zeppelin die is composed of two CCXs units. 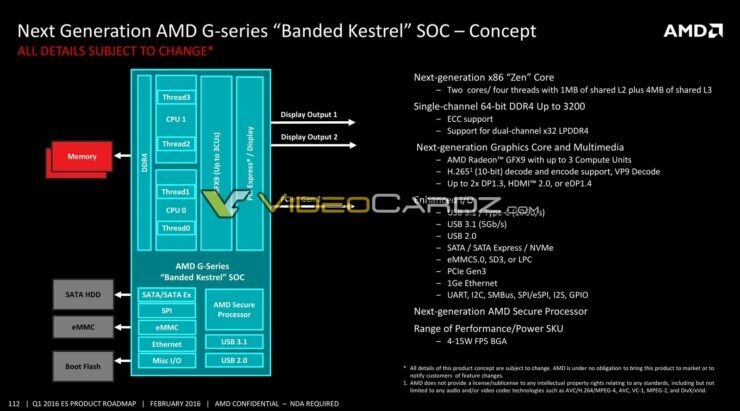 It is possible that AMD will be using Zeppelin dies on their upcoming HEDT cores used on X399 platform. Each Zeppelin die has 16 MB of L3 cache and 4 MB of L2 cache so that gives the chip a total of 64 MB of L3 cache which is quite an abundant amount. Each Zeppelin die is highly scalable and can be configured in multiple products. There’s single ZP dies for Snowy Owl “BGA”, dual ZP dies for Snowy Owl “MCM BGA” and quad ZP dies for Naples “SP3 MCM Socket ed”. In MCM config, each die has a coherent interconnect fabric that AMD calls “Infinity Fabric” that can communicate with other cores and the IMC. Naples as of now is planned for launch in Q2 2017 and AMD will have more details to share on 16th May since they have planned a Financial Analyst Day. 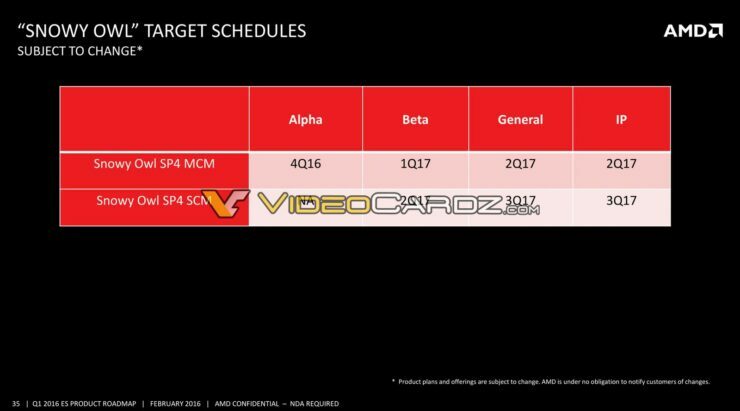 The slides don’t stop at that and start comparing AMD Naples with Intel’s Skylake-SP platform which is also launching mid 2017. 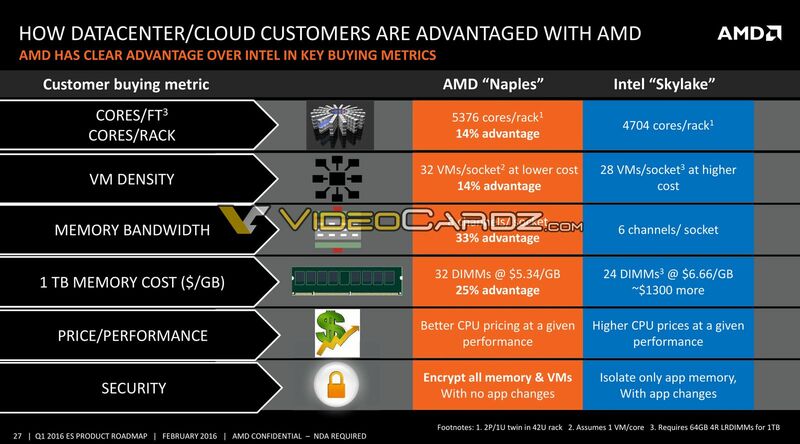 AMD says that there’s a 14% advantage of cores per rack that ship with their Naples platform compared to Intel’s. On Intel, a singular rack will consist of 4704 cores while AMD’s Zen based Naples Rack will ship with 5376 cores. There’s also 14% advantage in VM (Virtual Machines) per socket. Memory bandwidth sees a 33% advantage as AMD has 8 channels while Intel’s Purley platform is configured for 6 channels per socket. Intel platform also supports 24 DIMMs while AMD can support up to 32 DIMMs. 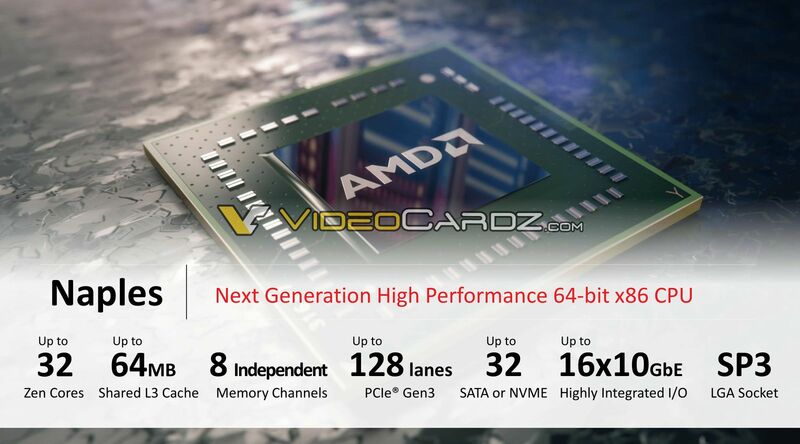 AMD is also suggesting highly competitive price to performance ratios on Naples processor that will give them a clear edge in the enterprise market. Next up, we have Snowy Owl series which is also very similar to Zen but features lower core count and less Zeppelin dies. This is the competitor of Intel’s Xeon E5 Bronze and Silver series processors. Snowy Owl has several configurations that go as high as 16 cores, 32 threads, 32 MB of L3 cache. The chips support up to quad channel memory, feature 64 PCI-e Gen 3.0 lanes, can run up to 16 SATA / NVMe devices and will ship in BGA form factor. 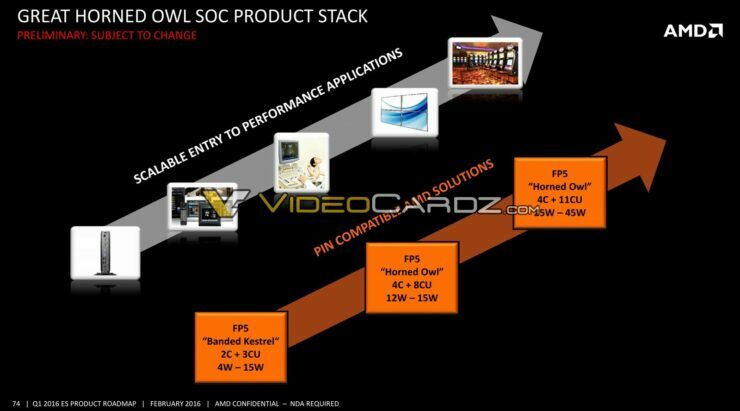 Entry level Snowy Owl chips will feature 4 to 8 cores, the mid-level chips will feature 8, 12 and 16 core configurations while the Naples CPUs will come with higher 16, 24 and 32 core count models. The mid tier chips will start shipping in Q2 2017 while the entry level chips will hit market availability in Q3 2017. AMD also has four more products in the form of CPUs and APUs that target the embedded markets. 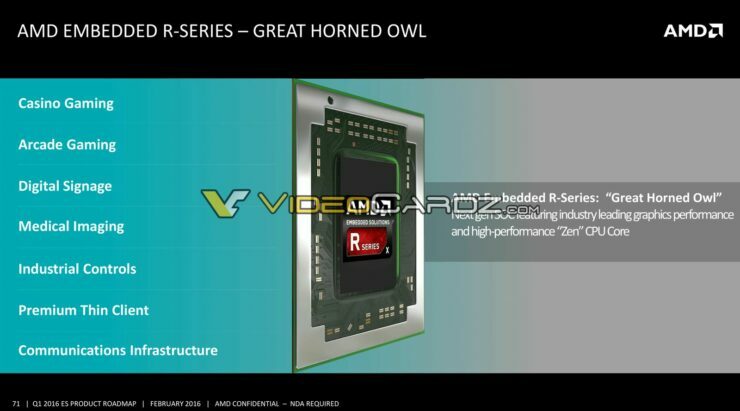 In 2017, AMD will launch the Great Horned Owl and Branded Kestrel series of CPUs and APUs. 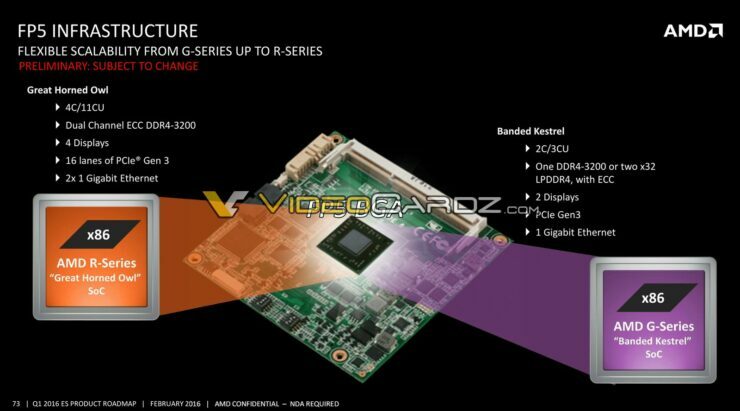 Both will be based on the 14nm Zen core architecture with 2-4 cores and TDPs between 15-65W. 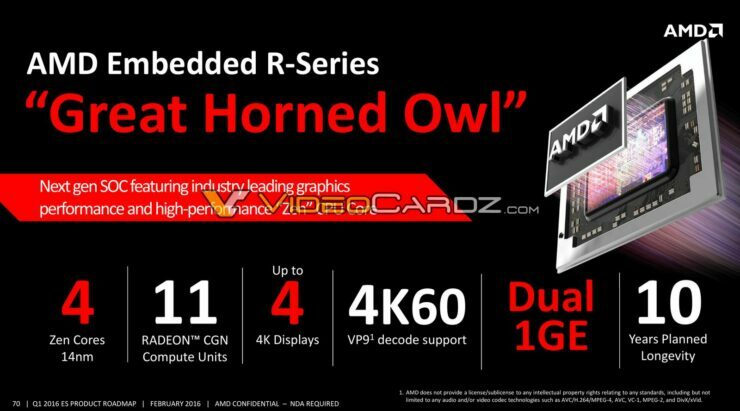 The APU models will ship with 11 CUs “Great Horned Owl” and 3 CUs “Banded Kestrel” while supporting single and dual DIMM DDR4 channels. The 7nm successors to these will deliver vast improvement in efficiency, performance while featuring same core count. TDPs will also go down with a generational update on the new Zen 2 cores. 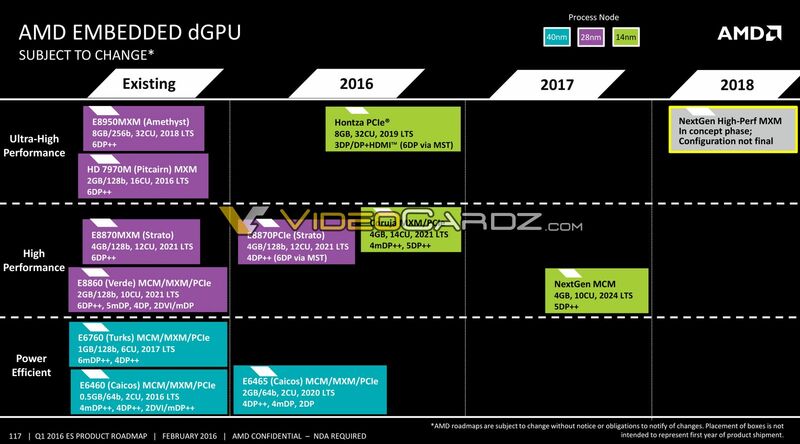 AMD has also posted a embedded dGPU roadmap which mentions a new MCM package product with 4 GB VRAM, 10 CUs and 5DP++ arriving in 2017. A next-generation high-perf MXM variant is also planned for 2018 but it’s still in concept phase. There’s a whole bunch of details with in the slides posted here so take your time going through all of them.